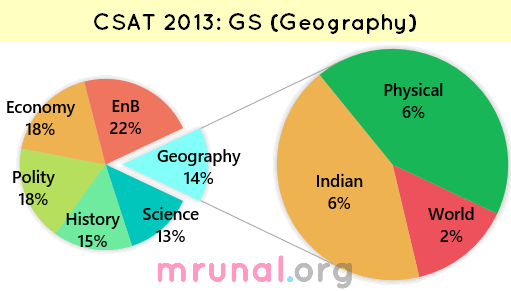 14 out of 100 MCQs in CSAT 2013 were from Geography. Last year it was 11. Majority of the question can be solved directly from standard reference books/sources for Geography viz. Within Indian geography, agro related Qs. receive attention, just like last year. Within Physical geography, ocean, temperature related Qs, just like last year. *Qs related to National parks, wildlife etc. classified under EnB (environment and biodiversity). 1. Which one of the following pairs is correctly matched? In the school atlas, check the physical map of Africa. You’ll see Atlas mountain range in the Top-left corner (=north Western) => Answer B is correct. Okavango basin/swamp= In Southern part of in Africa. Hence final answer (B) Atlas Mountains : North-Western Africa. 2. “Climate is extreme, rainfall is scanty and the people used to be nomadic herders.” The above statement best describes which of the following regions? but they’re not nomadic “herders”. Their primary occupation is hunting and fishing. Nomadic life= yes. The mid-latitude (Central Asian) grassland were once home to pastoral nomads like Kirgiz, Kazakh and Kalmuks. nomadic life? = No. The farmers here use mechanized equipment and do wheat cultivation on large scale. Q. The Narmada river flows to the west, while most other large peninsular rivers flow to the east. Why? It occupies a linear rift valley. It flows between the Vindhyas and the Satpuras. The land slopes to the west from Central India. Refer to NCERT 11th standard, Geography, 3rd chapter, page number 27. 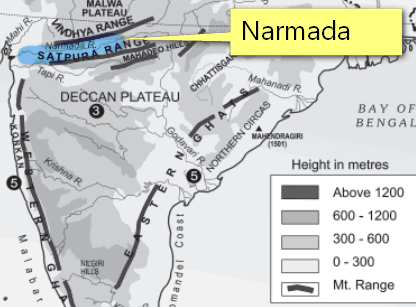 It says Narmada and Tapi flow through rift valleys caused due to the upheaval of Himalayas. Also it is given in the last line of the page as it flows through the rift valley with the Satpura in south and Vindhyas in the north. But there is no option for 1 & 2. We can consider maybe that flowing between the ranges may not cause the river to flow west and it is only a fact. Refer to NCERT Class 9 Contemporary India textbook, chapter 2, page number 10. It gives the contours of the Indian physical systems. We can see that Narmada is flowing through the area where the land is not sloping towards the west from central India, but it is flowing west because of the rift valleys only. Natural gas occurs in the Gondwana beds. Mica occurs in abundance in Kodarma. Dharwars are famous for petroleum. Refer to level 2 Q6 in Pearson’s General Studies Manual (2011), all three statements are directly lifted. And as per Thorpe (author of the Manual) only Mica-Kordema Statement is correct. Another reference is Indian Geogrpahy, Majid Hussain Page 7.18 The main center of mica production in Jharkhand and Bihar are Kodarma, Dhorhakola. Dharwar = district in Karnataka. Not related with petroleum. Hence answer: (B) only 2. Which of the following is / are the characteristic/ characteristics of Indian coal? Standard reference books (NCERT, NIOS, TMH, Majid) are silent about low ash fusion temperature of Indian coal, hence time to dig internet. Final answer A: only 1 and 2 correct. 1. Which of the following statements regarding laterite soils of India are correct? They are generally red in colour. They are rich in nitrogen and potash. They are well-developed in Rajasthan and UP. Tapioca and cashew nuts grow well on these soils. Laterite soils are rich in iron and aluminum but poor in nitrogen, potash, potassium, lime and organic matter. Hence Statement #2 is wrong. Eliminate all answer choices containing statement #2. Thus we are left with final answer C: only 1 and 4. Laterite soil commonly found in areas of high altitude and heavy rainfall in Karnataka, TN, MP, Bihar, Orissa, Assam and Meghalaya. Hence Rajasthan doesn’t fit the bill. So, Eliminate choice involving Statement#3 and you’re still left with answer C.
Hence answer must contain both Cotton (#1) and Rice (#3). And answer must not contain Wheat(#4). Thus we are left with final answer C: 1, 2 and 3. Thus, final answer (A): 1 and 3 only. had the axis of earth been perfectly perpendicular to the plane of ecliptic, the sunrays would have been verticle over the equator all the year round and amount of energy received at any place would have remained constant throughout the year; hence no change of seasons. Also in that situation, the days and nights all over the earth would have been exactly equal throughout the year as it happens at the time of equinoxes. Hence answer is (C) exists as groundwater. The question is about cause of thunder during a thunderstorm (and not the cause of thunderstorm itself). Thunder is the sound caused by a lightning discharge. Lightning heats the air in its path and causes a large over-pressure of the air within its channel. The channel expands supersonically into the surrounding air as a shock wave and creates an acoustic signal that is heard as thunder. So is the answer D=none of above. The annual range of temperature in the interior of the continents is high as compared to coastal areas. What is / are the reason / reasons? Thermal difference between land and water. Variation in altitude between continents and oceans. Heavy rains in the interior as compared to coasts. water is bad conductor of heat. Due to this moderating effect of the sea, places near coast have low range of temperature and high humidity. The places in the interior of continent do not experience moderating effects of sea. These places have extreme temperature. => Statement #1 is correct. This eliminates answer choice C, because it doesn’t contain #1. But the interiors in Central Asia, receive very poor rainfall due to distance from sea. Annual precipitation is usually low in the interior areas. Hence #4 cannot be generalized. This eliminates choice D, because it contains #4. Thus we are left with two choices A and B. So final answer boils down to whether statement #2 is right or wrong? Relook at the question: it asks about why “annual range of temperature” is high in interior areas. ok then, first What is annual range of temperature (ART)? Ans. It is the difference between mean temperature of the warmest and the coldest months. We know that Shimla and Jalandhar are located @same latitude yet Shimla is cooler than Jalandhar because of difference in altitude. As we move up in the mountains, temperature goes down. but that is to justify difference in ART between two land-places. Observe that Western Ghats and Himalayas have lower ART compared to coastal areas in TN and Andhra, Goa and Kerala coast. Therefore, Variation in altitude between continents and oceans= not the valid explanation for given question. Update Jun-26-2014: UPSC uploaded official answerkey. Correct answer is: A. Which of the above are responsible for bringing dynamic changes on the surface of the earth? lolz, Debatable on what exactly is meant by “dynamic” changes on earth surface and how far we drag the logic about factors responsible such dynamic change. if you consider the tides that cause coastal erosion =dynamic change on earth’s surface. Then tides occur due to gravitational pull of the Moon=> #3 is right. earthquake =brings dynamic change on earth surface=>#4 plate movements is right. volcanos= brings dynamic change on earth surface=>#2 geothermal energy movements is right. Rotation =Responsible for day and night- cannot bring ‘dynamic changes’ to earth’s surface. So #5 is wrong (or implausible). revolution of earth = responsible for seasons. And Heavy monsoon => landslides and soil erosion= dynamic change to surface. hence #6 must be in the answer. Therefore viewpoint #1 is wrong when it says #5 is wrong. Electromagnetic radiation from Sun=> causes rainfall and snow melting=soil erosion=dynamic change to earth’s surface but it is a farfetched argument in terms of cause and effect because you’ve to factor in greenhouse gases, deforestation etc. Same goes for gravitational force, hence 1 and 3 are false, final answer (C) 2, 4, 5 and 6 only. anyways, final arbitrator is official answerkey of UPSC. Update Jun-26-2014: UPSC uploaded official answerkey. Correct answer is: D all of them responsible. Answerkeys for remaining topics, coming soon + thanks Mr. Manu Jha (मनु झा) and Mr.Shiva Ram for providing help. Variation in the duration of day and night from season to season is due to the latitudinal position of the place… NCERT Class 9, Chapter 1.. He asks a question that why is the duration btw day and night hardly felt in Kerala and highly felt in J&K?? there are some answers which dont match with PD… Although both(Mrunal and PD) are reliabe,then which one should be followed…..
regarding natural gas in gondwana beds…its given in the Economic survey book in chap 11 (energy) that shale gas formations are spread over sedimentary basins such as cambay,Gondwana,kg and cauvery…and i think this shld be the official answer of upsc as it is frm official book of goi..
What is annual range of temperature (ART)? —>>it is quite correct as in northern hemisphere warmest(JuLY) and coldest (January)!! THE MAP WHICH YOU DISPLAYED IS REFERRING AATR hence your explanation is wrong as it is no concerns with AAR. Mr. mrunal i wish that you should analyze the definitions thoroughly i.e. 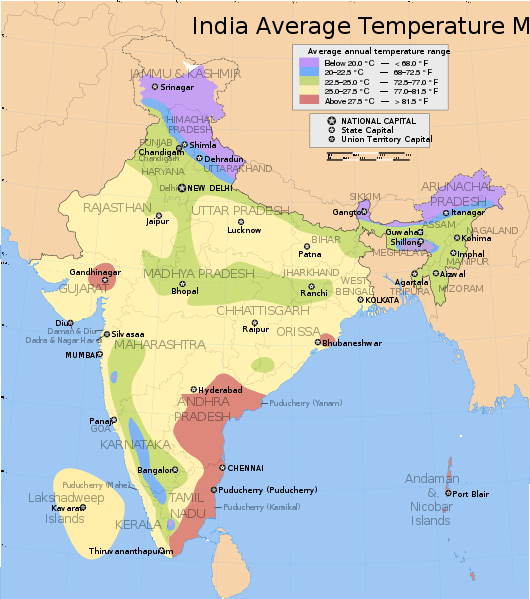 “ANNUAL RANGE OF TEMPERATURE & average annual temperature range”. 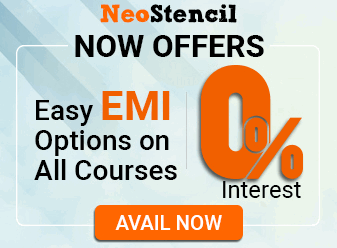 REFER THE LAST TABLE OF ncert class IX ON PAGE 41. $$$—leh is a part of HIMALAYAS HAVING HIGH ART!! HOWEVER YOU ANSWERED IT CORRECTLY BASED ON YOUR MAP.HOW???? and explaining each question (even wrong option for more clarification). may god fulfil your all wishes. thunderstrom questions explanation is given in 7th class ncert of science and tech..it is due to lightning. .so mrunal is right….. Question of Mica, Petroleum and Gas. This question could have been very easy to answer if the candidate would have learned Indian Geology Time Scale (or the first chapter of Gepgraphy of India by Majid Hussain which is usually skipped or lightly taken). Petroleum in Dharwar system – Wrong because presence of fossils was available only from Mesozoic Era (Gondwana system), so petroleum will not available in the previous period. answer of second questn is option D i.e. siberian tundra. @Neeraj: Just because Venus doesn’t have seasons doesn’t mean Earth doesn’t experience changes due to rotation and revolution! You could argue that even day and night cause ‘dynamic’ changes on the Earth’s surface – the melting of snow on mounatains on a hot sunny day could be a ‘dynamic’ change as well! And the rotation of the earth also creates a centrifugal force which impacts tides. I got this website from my pal who informed me concerning this site and at the moment this time I am visiting this web site and reading very informative content at this place. I am really thankful to the owner of this web site who has shared this impressive article at at this place. building stones i.e. sandstone, granite, marble. Why leh is colder than thiruvananthpuram? Why dehradun and shimla are colder? The tides are formed attracting force on the earth from sun and moon. Sir,fact is more important or concept for upsc preliminary exam?? I am religiously following your blog and youtube channel. There is a discrepancy in both. In the question “Variations in the length of daytime and night time from season to season are due to” the youtube video as well as the Disha publication (21 years CSAT GS IAS) which you refer says the answer should be (b) whereas according to this blog or GC Leong the answer should be (d). Please clarify the doubt. Are we missing some points in the question or the answer provided by UPSC is wrong. Got clarification by scanning the comments on youtube. Thanks for producing such a wonderful series of videos. had the axis of the earth been perfectly perpendicular to the plane of the ecliptic, the sun rays would have been verticle over the equator all the year round and the amount of energy received at any place would have remained constant throughout the year; hence no change of seasons. Also in that situation, the days and nights all over the earth would have been exactly equal throughout the year as it happens at the time of equinoxes. Sir if the answer to the question is (d) then why is the answer to this question is (b) in a book published by disha which says its exclusively solved by mrunal?